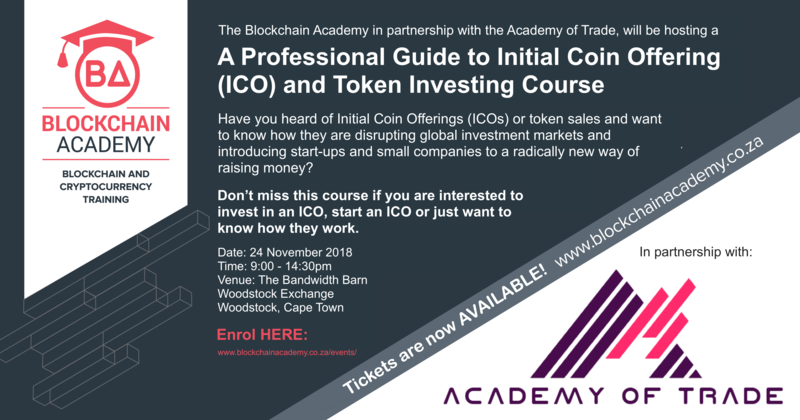 Join us for our first Professional Guide to Initial Coin Offering (ICO) and Token Investing course in Cape Town in partnership with The Academy of Trade. 2018 may be remembered as the year where Initial Coin Offerings (ICOs) began to seriously disrupt global investment markets and introducing start-ups and small companies to a radically new way of raising money by launching crowdfunding campaigns using cryptocurrency tokens. However, many of these ICOS are proving to be scams or doomed to fail. ICOs, also known as token sales, are events where digital tokens are issued to investors over a blockchain-based platform for use in a smart contract. Issuers accept cryptocurrencies such as bitcoin or Ethereum from investors in exchange for a proprietary digital medium of exchange on the platform, which is referred to as a token. So why are so many individuals and companies interested in ICOs? Why are they important and what should you know? Join us for this course to learn more! The course is for individuals who are interested in Initial Coin Offerings (ICOs) and token sales for investment purposes and looking at starting an ICO. The course will be held at The Bandwidth Barn, Woodstock, Cape Town, from 9:00-14:30pm. The course will enable you to have a greater understanding of how ICOs work and how to invest in them successfully. Why is it the future of fundraising and investing? Don’t jump in straight away. Be objective about the ICO project. Is the project and the go to market strategy viable? Technology – how to analyse if the technology solves an existing problem or inefficiency? Business – how to estimate if the business model makes sense? If you are investing in a token you will need to know what the fundamentals are that make up the value of that token. Social presence has a huge impact on the validity and success of an ICO. The strength and size of the community will determine whether the ICO reaches its target token sales and help increase the value of the token when on exchanges. Understanding who the founding team is and whether they have the required skills and competencies to complete the project is imperative. technology? How to analyse if the underlying technology could work in the real world. Value is perceived. You will need to know the black art of valuation. You will need a scorecard to rate all the above-mentioned criteria, and then evaluate whether the project is worth investing in. You will have an opportunity to ask the instructor any questions you have during and after the course.